Orange County is usually synonymous with Disneyland. Though I love me some Mickey, when I’m in the OC, Disney isn’t the only thing on my mind. There are certain desserts I always stop for that are worth a quick drive. Check out The Loop’s limited-time flavors before ordering. 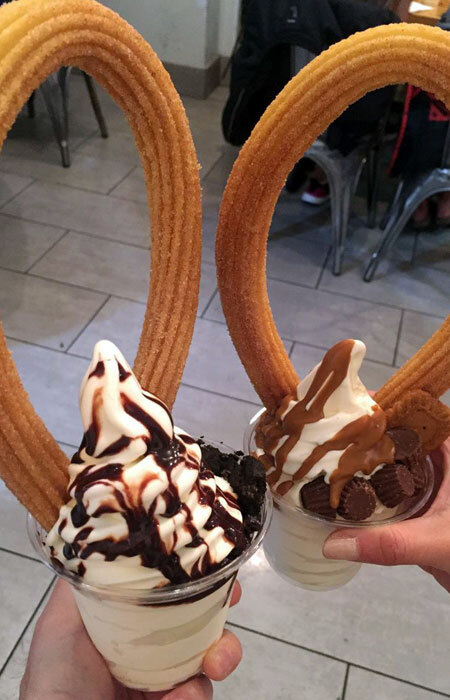 Whether you want your churro plain, glazed or paired with soft serve, it’s a party in your mouth at The Loop. My favorite is the Chilled option ($5.50), which comes with a churro, vanilla soft serve and various toppings. My go-to toppings are Cookies and Cream (chocolate syrup and crushed Oreos) or Double Butter (cookie butter syrup, peanut butter cups and a Biscoff cookie). The iconic churro holds its shape well, even with the soft serve — the knot base keeps it anchored so you don’t have to worry about your churro disintegrating into a mushy mess. It’s always better to be in the loop. Cookie Monster and Peanut Butter S’mores (ice cream) with sprinkles, hot fudge and Oreos in an unglazed Milky Bun. Alright, you already have the inside scoop on Afters Ice Cream if you read Melissa Chang’s “The best things I ate in L.A.” But no joke, the hype behind these donut ice cream sandwiches is real. The Afters concept is simple but mind-blowing: ice cream inside a glazed or unglazed donut, which they call a Milky Bun, plus a free topping. Milky Buns are on the thinner, lighter side, a la Krispy Kreme. If you want a “healthier” option, choose the unglazed version. 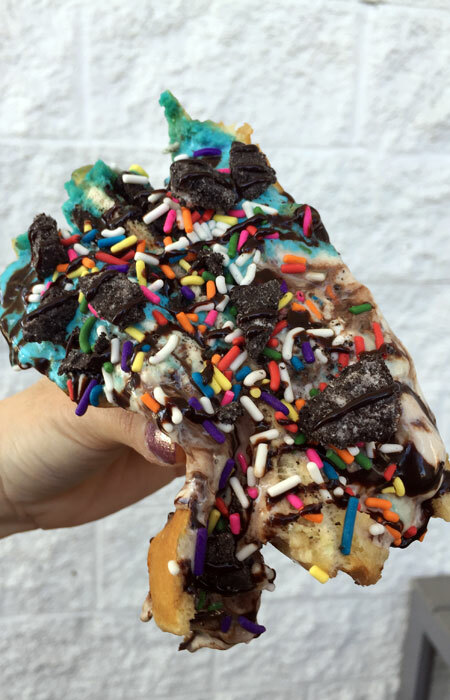 At Afters, calories don’t count. My favorite — and the most popular — ice cream flavor is the blue-hued, vanilla-based Cookie Monster, made with Oreos and Famous Amos cookies. Other popular choices include Peanut Butter S’mores (peanut butter, marshmallows, fudge and pretzels), Jasmine Milk Tea (think of your favorite boba) and Milk & Cereal. Fun fact: Different locations might have items specific to that store. For example, Fountain Valley (home of the original Afters) features chocolate Milky Buns, while the Irvine store has Thai Tea ice cream. When I visited, they had just opened their 11th location in Fullerton. Am I the only one who hopes they’ll open in Hawaii? If cheesecake and pie had a baby, the Cereal Killer would be it. The Cereal Killer Cheesecake debuted last Halloween as a seasonal special. By popular demand, it now has a permanent place on The Pie Hole’s regular menu on Fridays, Saturdays and Sundays. Think milk and cereal in one delicious pie. 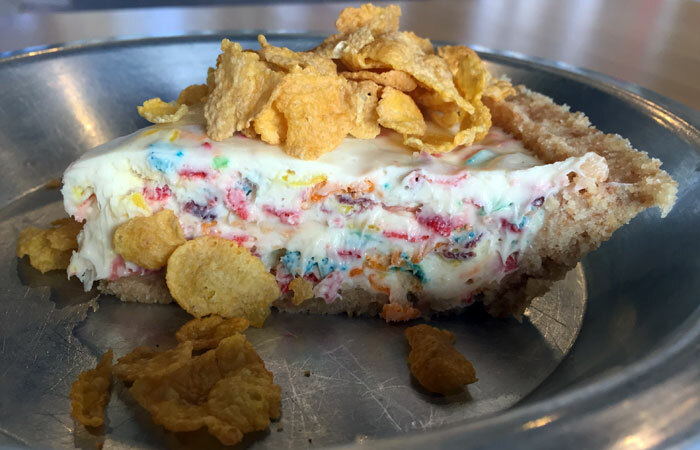 The Nilla wafer crust is delectably crumbly and slightly chewy, and the house-made cheesecake is sweet and crunchy, since it’s infused generously with Fruity Pebbles and topped with Frosted Flakes. A hint of citrus adds some zing. Yup, breakfast can definitely be in a pie. The Churro croissant has a generous cinnamon sugar coating and a dulce de leche cream filling. San Francisco-based Mr. Holmes Bakehouse opened in the OC in February. 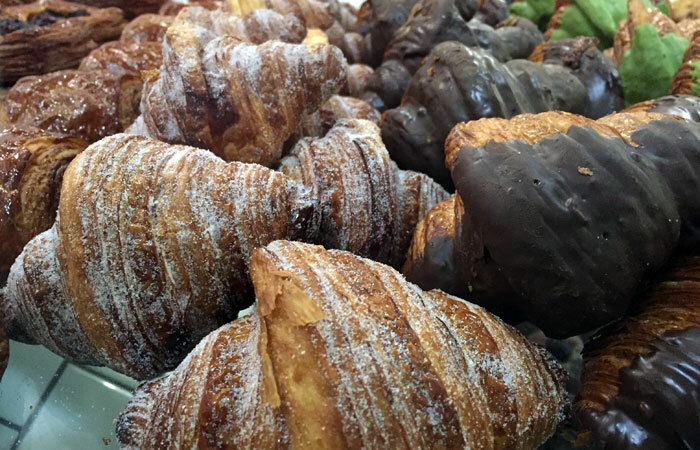 While it can be tempting to stick with the Cruffins (about $4.50 each), it’s well worth trying some of the other pastries. One of my favorites is the Churro croissant ($4), filled with a sweet dulce de leche pastry cream and rolled in so much cinnamon sugar that I end up with a sweet dusting on my face. The croissant is light and flaky and the pastry cream is slightly sweet and silky. I get two of these croissants — one for now, one for later — and even out of the fridge the next day, it’s just as fresh-tasting. Tip: If you don’t eat your croissants or Cruffins right away, put them in the freezer and toast them before eating. Pastries with fillings should be eaten immediately … but that probably won’t be a problem. Peanut butter chip cupcake with luscious red velvet ice cream in between is one of my favorite combos. Sprinkles Cupcakes are glorious in and of themselves. But they taste even better paired with the company’s hand-churned ice cream, a la the Sprinkles Sundae ($6.95): a heaping scoop of ice cream in between cupcake halves. Each ice cream flavor I’ve tried is extraordinary. Red velvet, my favorite, is a sweet cream complete with red velvet cupcake chunks. Cap’n Crunch is infused with plenty of caramelized cereal bits. And that’s just the beginning. This is cake and ice cream 2.0. The cupcakes are baked fresh daily, and the layer of ice cream keeps them from drying out. The ice cream is ultra creamy and come with extras ranging from cupcake chunks to fleur de sel crystals. My advice when it comes to ice cream flavors: just indulge in whatever you’re craving. You get two samples before making your decision, and cupcake and ice cream flavors change daily. 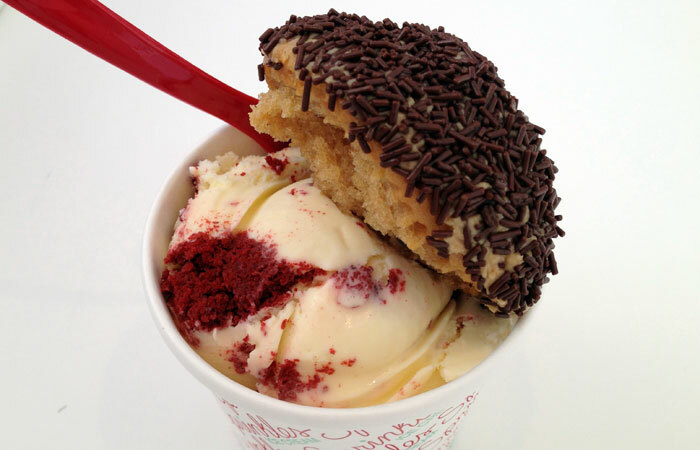 Note: Did I mention that Sprinkles also has frosting shots, shakes and malts, ice cream cookie sandwiches and more? Talk about a kid in a candy store.